What time is it? 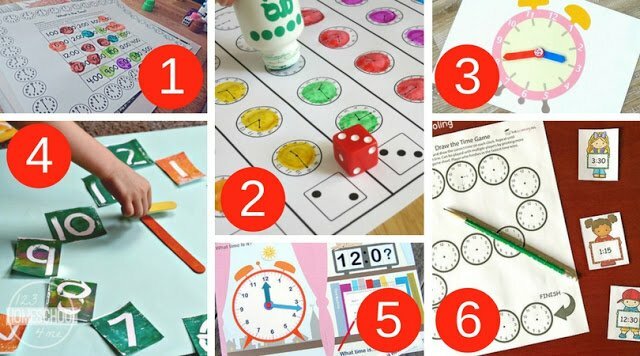 It’s time to grab a whole bunch of free homeschool printables and Telling Time Games! 26 of them, in fact! Telling time games are always fun, especially when they involve dot markers! Kids learn how to tell time by the hour, half hour, and quarter hour with this free game set. And if that’s not enough, here is another printable time-telling game. Combine story-telling and time-telling in this fun game. How about a “What Time Is It?” game that fits inside one handy file folder? Even little ones will enjoy these telling time board games. Make a clock out of rocks! Let your child use his/her hands with these clock playdoh mats. You can also make a clock out of a hoola-hoop! Make a clock out of sidewalk chalk. 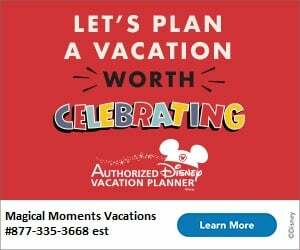 Time includes days, weeks, months, years, and seasons! Create a huge floor display to teach about the seasons timeline. 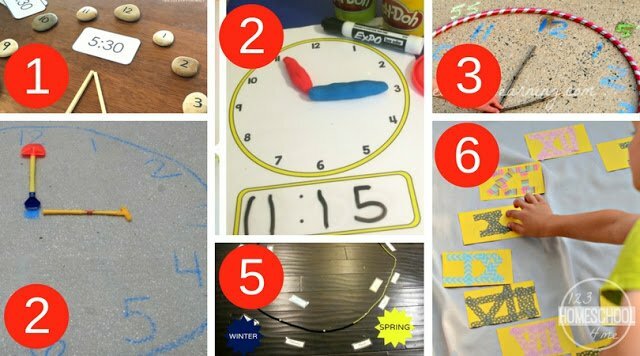 Some clocks are labeled with Roman numerals, making this activity the perfect opportunity to teach both Math skills simultaneously. 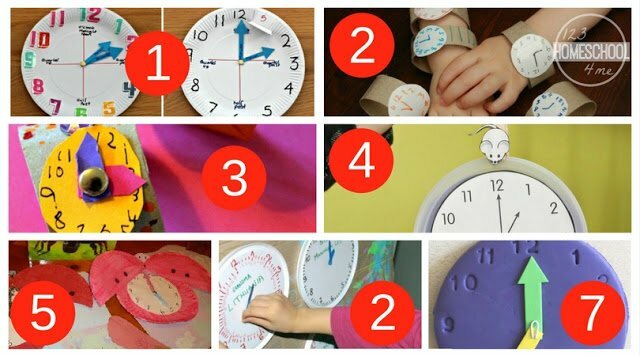 Make this paper plate clock to help your child learn about time. Got an empty toilet paper roll handy and short on time? Then make these quick and easy wristwatches! Or, with a little more effort, let your child get crafty with moveable watch faces on these wristwatches. 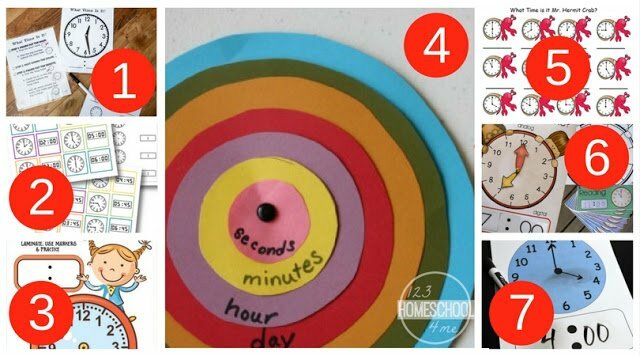 Recite the “Hickory Dickory Dock” poem and practice rhyming as well as telling time with this clock craft. Make your math lesson stretch into a literacy lesson by reading The Very Grouchy Ladybug and creating some cute ladybug clocks. Learning about time zones too? Then make this world clock craft. Create a magnet clock that can go on the refrigerator, and use it for practical things like daily routines and schedules. This printable clock and worksheet set can be laminated and used over and over. Practice with these telling time cards, and review what your child knows. This “What’s the Time?” printable helps children grasp the concept of time. Use concentric circles to help teach about units of time. The clock faces on this cute little hermit crab worksheet will be fun for your child to work out. Let your child enjoy coloring, cutting and then practicing with this telling time printable. With practice on this DIY whiteboard, telling time will be easy. 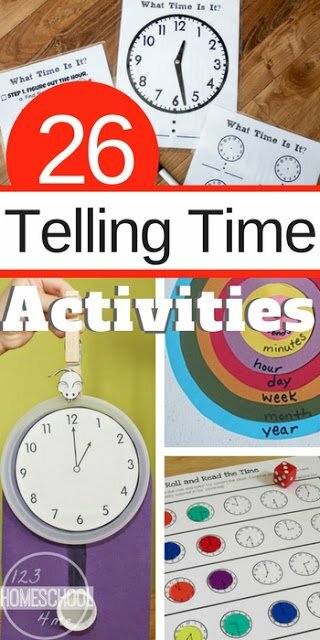 If you’re stuck and don’t know where to start when teaching your child about telling time, then this is the best resource for you! Try any of these telling time activities, and your child will be reading clocks – well, – in NO TIME!